Are you using video in your inbound marketing strategy yet? Chances are, you already are! Reports in 2016 show that 96% of B2B organizations use video in some capacity in their marketing campaigns, 87% of online marketers state that they use video content, and 86% of colleges and universities have a presence on YouTube. Video is important to individuals since 1/3 of all online activity is comprised of watching video. 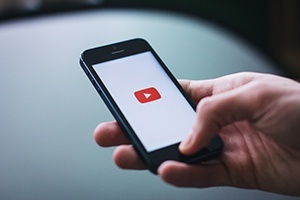 YouTube states that mobile video consumption continues to rise 100% year after year and 50% of executives look for more information after seeing a product or service in a video, according to Forbes. While video is proving to be an integral part of digital marketing, are you getting the same results from your efforts? Real estate listings with a video can expect to receive over 400% more inquiries than listings without a video. Additionally, ComScore reports that after watching a video, 64% of users are more likely to buy a product online. If your want your videos to generate the same staggering results, read on to learn the seven principles of creating video CTAs (calls-to-action). 1. Always have a CTA. First and foremost, your video content should always have a call-to-action. One thing that every great speech has throughout the history of the world is a strong call-to-action. Great orators ask the audience to do something next. Your videos should follow the same formula and inspire action in the video viewers. Make sure that every video contains a CTA. This could be something as simple as saying "Give us a call!" or "To find out more, click below." No matter what you ask, just be sure to ask it of the audience. 2. Decide on the purpose of the CTA in the video. By adding a CTA to your video, are you hoping to generate leads or nurture leads? Ideally, the CTA aligns with the video content. Read more about mapping video to each stage in the buyer's journey. Your call-to-action can: send a viewer to your website, prompt them to give you a call, promote a stellar content offer that's a similar topic to the video, ask the viewer to subscribe or suggest an additional video for them to watch. No matter which CTA you choose, make sure that you have a clear goal for the action you are hoping to inspire in your audience. Volkswagen makes use of multiple CTAs at once in order to allow the viewer to choose their next step after watching a video. 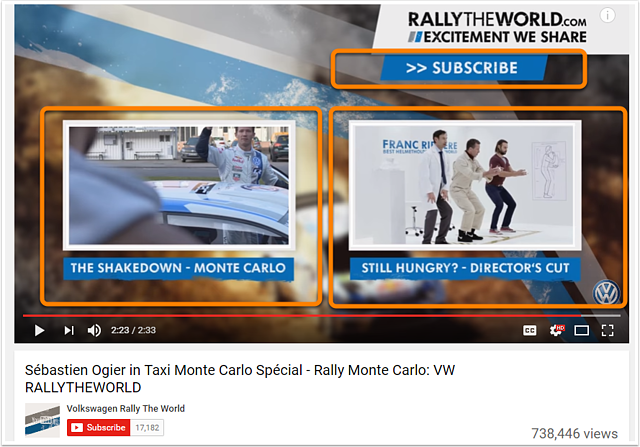 Videos in Volkswagen's Rally The World campaign for the World Rally Championship provide CTAs to closely related videos and a way to subscribe. 3. Use both verbal and visual CTAs. Telling your viewers what their next step should be can be a powerful tool, but take advantage of the visual nature of video to inspire the viewers to take action. Adding clickable elements to your video is possible on a number of platforms. Click to see how to add a CTA on your video-hosting platform of choice: YouTube, Wistia, Vimeo. 4. Make the call-to-action a simple step for on-the-go viewers. Half of your viewers will be watching your content on a mobile device. Is it possible for the mobile audience to take that action? A complex sign up process for an app or a phone call for a detailed consultation is not going to be a possible next step at the time of viewing, especially for users that are multitasking on their mobile device. If the recommended course of action isn't possible for the viewer at that time, is there another action you can recommend? Aside from busy multitaskers, another common reason why your viewing audience can't take the next step is because it's too early! If you're announcing a new product that's not available for purchase, what kind of call-to-action can you ask of your viewers? Here's an example. Walt Disney Animation Studios will be releasing a full-length animated feature film in a few months. 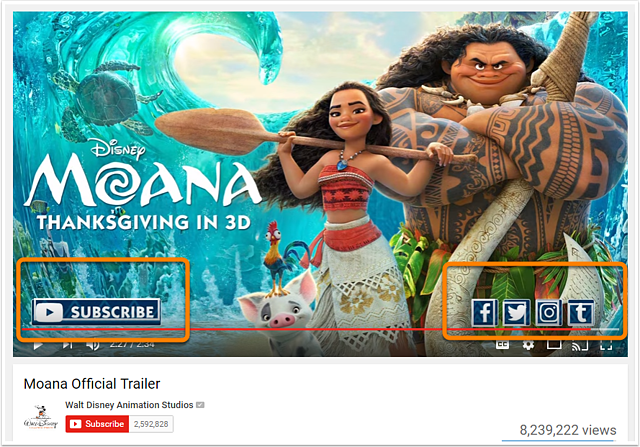 Disney doesn't use the movie trailer on Youtube to only generate awareness of the film. Instead, Disney suggests for viewers to subscribe to their channel and connect on social media networks with a number of calls-to-action that are highlighted below. 5. Be concise and direct. Ad Age reports that every video loses approximately 1/3 of its viewers in the first 30 seconds. As attention spans for video continues to get shorter and shorter, marketers have even less time to engage their viewers. Don't waste time with a verbose call-to-action or ambiguous language. Provide your viewers with their next step in a concise and direct way. 6. Don't wait to the end to have a CTA. If a CTA is at the end of a video (that no one sees) does anyone click it? If the only CTA that you have is at the very end of the video, then the majority of viewers won't ever even see the CTA let alone click on it or take the action. Just how many viewers aren't seeing the end of your video? You can expect to lose 20% of your audience during the first 10 seconds of video on average and this abandonment rate peaks around 120 seconds with a 60% abandonment rate. Place (or verbalize) your call-to-action towards the beginning of the video as well as the end to ensure that the majority of your audience receives the message. Allrecipes has the right approach to CTAs in their educational "how to" video content on YouTube. There's a good chance that the viewer is going to be busy during or shortly after learning how to create whatever is shown in the video. 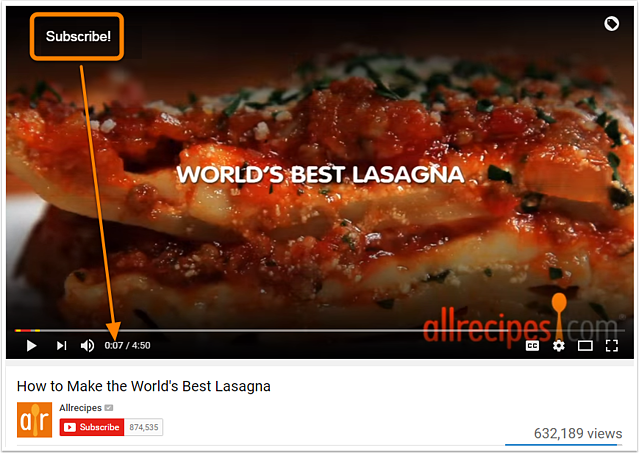 Allrecipes places a CTA at the beginning of the video, just in case their viewer doesn't make it to the end (or starts eating dinner right after)! How To Make the World's Best Lasagna has a visual CTA only seven seconds in to the video to ensure maximum visibility. 7. Place emphasis on the CTA by using contrast. A CTA in a video isn't all that different than a CTA on a web page, blog post, or email. The same guidelines apply to the visual treatment of the CTA in a video. A visual CTA should be an obviously clickable element and stand out from everything else that's on the screen. Video has an extra challenge in getting the right emphasis on the CTA because the motion, color and background changes in a video is competing for the viewers' attention. Make the CTA prominent to maximize the click-through-rate. Are you experiencing success with video CTAs? Let us know in the comments what is working in your video content!